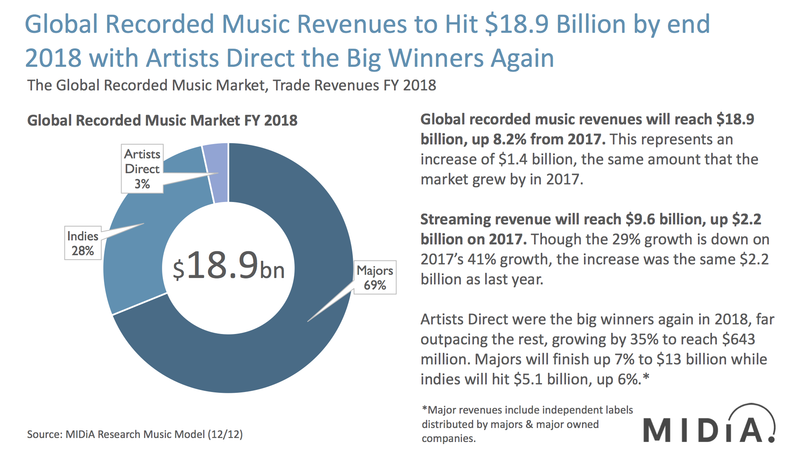 The global recorded music industry will turn over $18.9bn in 2018, with streaming making up 50.8% ($9.6bn) of the total. That’s according to Midia Research, which today (December 18) published its projected 2018 figures, based on a combination of major label revenue reports to date, plus stats from industry organizations and confidential data from DIY distribution platforms. According to these numbers, the recorded music business’s $18.9bn turnover this year will represent $1.4bn annual growth across all formats – the same monetary increase seen in the prior year. The driver for that growth, easily offsetting download and physical declines, is, of course, streaming; according to Midia, the $9.6bn contribution from the likes of Spotify, Apple Music and YouTube this year is up $2.2bn on last year – which is, again, up by the same annual figure (+$2.2bn) as 2017 was on 2016. 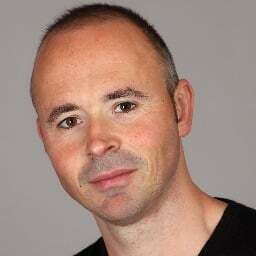 Midia Managing Director Mark Mulligan told MBW that he expected streaming to once again add $2bn to global recorded music revenues in 2019, but that the industry should prepare for streaming income growth in its biggest market, the United States, to decelerate. “In order to ensure this [$2bn] level of growth is delivered, newer streaming markets – especially Germany, Japan, Brazil and Mexico – will need to deliver, picking up the slack as big mature markets like the US and UK begin to slow,” he said. Mulligan’s comments come after Spotify’s Q3 performance showed the company enjoying healthy growth in Europe, the United States and Latin America, but struggling to keep up this pace in other markets where it is active, including Japan, Indonesia, Vietnam and South Africa. 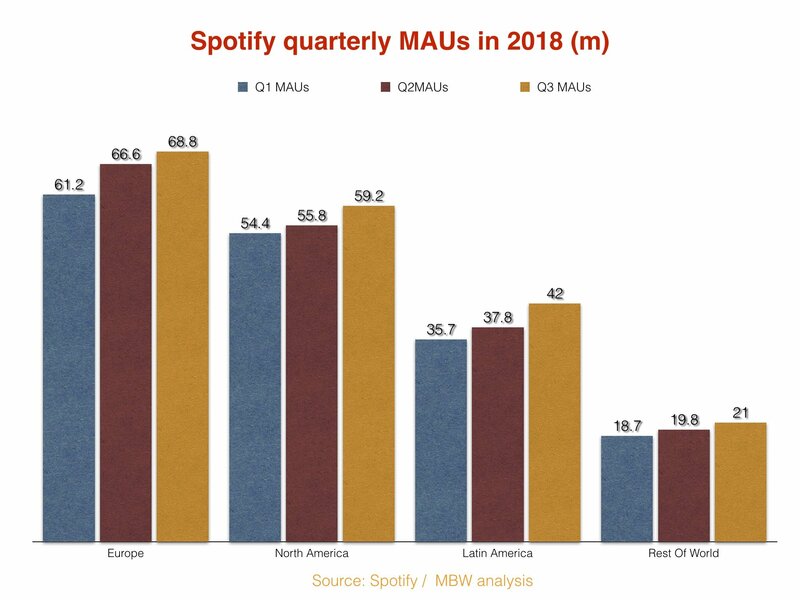 In the six months to end of September this year, Spotify added just 2.3m users and 1.1m subscribers in all regions outside the EU, US and Latin America. Midia’s data today shows that revenue booked by directly-distributed independent artists in 2018 is set to rise 35% on 2017. Major labels, according to Midia, will claim 69% of 2018’s $18.9bn haul, though this number includes revenue derived from copyrights owned by independent entities and distributed by Universal, Sony or Warner.